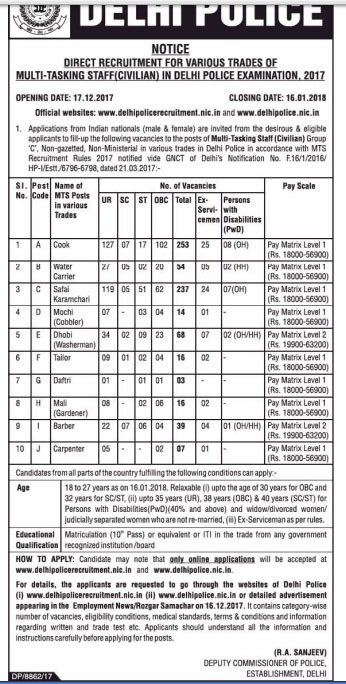 Delhi Police has invited online application from Male and Female candidates for the Delhi Police Multi-Tasking Staff Recruitment Advertisement for the posts of Cook, Safai Karmanchari, Dhobi (Washer Man), Water Carrier, Barber, etc. 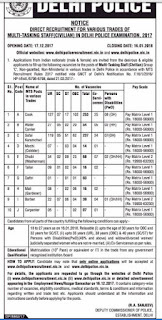 Relaxation is applicable for OBC 03 years, SC/ST 05 years, OBC PWD 08 years, SC/ST PWD 13 years as per government rules and regulations. Candidates will be selected on the basis of Written Test and Trade Test etc. Admit cards will be uploaded on the official website of Delhi Police Department in due course of time by Delhi Police. Candidates can check their application status whether their application for the post of MTS (Civilian) in Delhi Police Exam-2017 Provisionally Accepted / Rejected. To view status login your account. Admit card are available now. Candidates can download their admit cards using registration no. and date of birth.